Photos show the tank shapes but are not necessarily the 2000 gallon size. We have 2000 gallon poly tanks in several shapes including vertical, cone bottom, and horizontal. 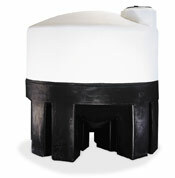 Some of our 2000 gallon tanks are available in more than one type of plastic. Most of our 2000 gallon poly tanks are available in more than one specific gravity rating. We have some tanks that are rated for "Water Only", while others are rated at 1.5 specific gravity, 1.9 specific gravity or even 2.2 specific gravity.